Maniac Cop 2 has been praised as the best of the two sequels to William Lustig's original Maniac Cop. Directed by Lustig and written and produced by Larry Cohen, the film's pedigree of talent in the genre film directing and writing department does not stop there. Among the cast are Robert Davi, Claudia Christian, Michael Lerner, Bruce Campbell and Clarence William III. Blue Underground is releasing the second and third films in the series in stellar Blu-ray Disc releases, which I made a point to review before Halloween despite the November release date for the films. You can read my review of both discs in the October, 2013 updates archived on this site. Now to accompany what is now the complete Maniac Cop trilogy on Blu-ray Disc sold separately at retailers on and offline and distributed by Blue Underground is the limited edition Maniac Cop 2 Original Motion Picture Soundtrack on Audio CD courtesy of the fine artists at Blue Underground as well. How limited is this CD? Only 1000 copies have been produced and each is numbered and when they are gone, they are gone. So for super fans of William Lustig films as well as this collaboration with Larry Cohen, who is an immensely talented writer and director in his own right and for fans of the film and the trilogy as a whole, this is a must add to your collection. 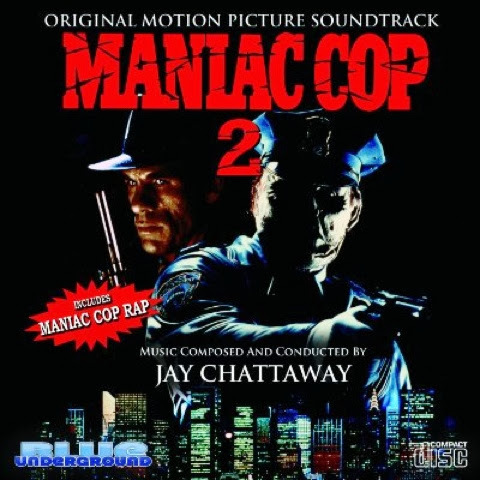 The soundtrack was composed and conducted by Jay Chattaway and the CD even features the notorious Maniac Cop rap single performed by Yeshua (Josh) Barnes and Brian "B.Dub" Woods and was also created with the assistance of Pete Levin and Wayne Lammers. The soundtrack is quite full on audio CD stereo capturing the orchestral mixing in cues that sound almost like Gregorian Chant with the post-modern gothic music that sets the mood whether you are relaxing to the tunes or playing them while working on something creative. There are a total of 15 tracks on the CD, which comes packaged in a standard CD jewel case and includes a full color insert with track listings, credits and colorful photos from the film. The soundtrack CD was executive produced by William Lustig and Gregory Chick. Maniac Cop 2 Original Motion Picture Soundtrack on Audio CD has a street date of December 3, 2013 on Amazon.com though the soundtrack will also be released as an MP3 digital download on November 19, 2013 at Amazon.com as well. If you are a fan of these films from Blue Underground on Blu-ray Disc and even DVD then get the limited edition audio CD. At only 1000 copies to be printed, I can 't emphasize enough that this is a must addition for anyone's collection. Maniac Cop 2 Original Motion Picture Soundtrack on Audio CD will debut in limited edition to only 1000 copies on December 3, 2013 at retailers on and offline courtesy of Blue Underground.